Hilma has announced the expansion of their line of wedge clamps with a new version of the clamp featuring a patented safety notch added to the tapered clamping bolt. The notch will support the upper die in the event of a pressure loss. 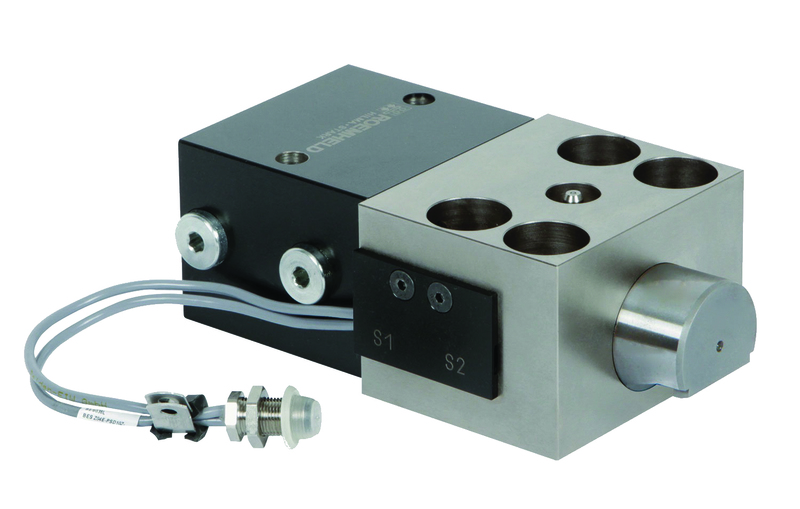 The wedge clamp consists of a hydraulic cylinder block and a bolt guided within the housing. As it clamps and the bolt advances, it mechanically locks the die in place with its 20 degree tapered clamp surface. In the unlikely case of a pressure loss, this new safety feature in the bolt will engage with a mating notch in the tapered clamping plate on the die set, securely holding the upper die. During unclamping, the extended bolt retracts fully into the housing for easy die removal. The wedge clamping elements, with single or dual action, exert forces of 3 to 69 US tons, and have a maximum temperature rating of 570°F. The clamps can be actuated via hydraulic, electric or springs. Position sensors are available to verify the extended / clamped or retracted / unclamped positions. Wedge clamps come in a variety of styles allowing customers to configure clamping arrangements using a range of options from cooling circuits to sequence valve controls. For more information on quick die change and quick mold change equipment, contact Hilma, +1 (636) 386-8022, or view roemheld-usa.com. Established in 1982, Carr Lane Roemheld Manufacturing Company (Roemheld USA) is a joint venture that unites the Old World craftsmanship of Roemheld GmbH, a top German workholding manufacturer, with Carr Lane Manufacturing Company, America’s premier tooling. ROEMHELD, HILMA , STARK and RIVI – the four group brands are among the worldwide market leaders for providing engineered solutions of assembly and handling applications, hydraulic workholding clamps, zero point mounting systems, production vises, and quick die and mold change systems.